Shonto’s traditional life of sustainability and prayer helped him endure the brutality of the U.S. government boarding school he was forced to attend as a child away from the loving family sheep camp he was asked to forget. Shonto speaks to audiences of all ages about inspiration and the importance of education and embracing cultural backgrounds. He is making his film debut as the character Cowboy in the upcoming Native-produced "Monster Slayer Project" – a movie about the Hero Twins, key characters in the Dineh’s origin story. A true storyteller, Shonto written and illustrated several books for Scholastic publishers. From a very young age, I found excitement in recreating facets of my universe in varying images. I was inspired and surrounded by Hozho (beauty), including the sounds of songs and healing chants accompanied with stories from elders. I survived boarding school partly because of my spiritual strength and retreat into my drawings. I was always drawing. “Arts Save Lives” is my mantra. “Shonto” in Dineh’ translates to sunlight on water -- a reflection of light on the canyon wall from the flowing water. My journey as an artist is to document my life and the world as I see through the lens I was born with through my Navajo experience while negotiating the modern. I have worn many hats in my life: shepard, BIA Boarding School inmate, cowboy, National Park Service Ranger, Wildfire crew, professional boxing team support, film actor, author and artist. 2010 - First Place - 89th Annual SWAIA Santa Fe Indian Market. Click here to view pictures. 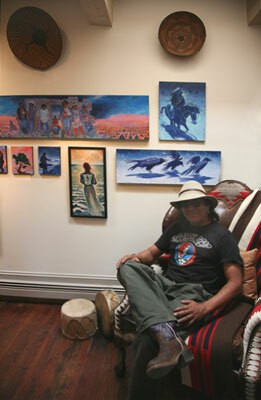 2010 - Best of Division A - Paintings, Drawings, Graphics, and Photography - 89th Annual SWAIA Santa Fe Indian Market. Click here to view pictures. Featured art, "Skinwalker" Robert Redford adapted from Tony Hillerman's book "The Skinwalker"